In addition to the functions and options of our popular DT-5TS unit, the DT-5TX panel tachometer also accepts various modules, enabling it to output data for analysis or record keeping. Up to two modules can be accepted simultaneously, offering an enormous number of combinations and options. 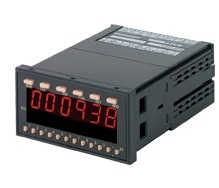 The DT-5TX measures and displays RPM, linear speed/rate, elapsed time, process time and accepts input signals from most types of sensors available today. One year warranty.